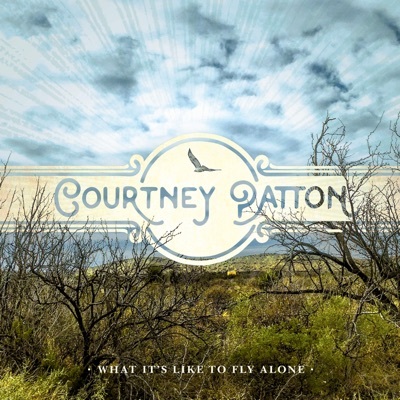 You know, it's a bit of a shame that I haven't had a chance to discuss Courtney Patton's solo work as much as I have her material with her husband Jason Eady - so let's rectify that, shall we? And the first thing to note is that while she's worked in indie country with Jason Eady, her own lane is a little different than his, less of a straightforward traditionalist and more leaning towards Americana or even folk. Now this means she typically brings a little more lived-in detail to her songs, and while the structure of her writing can feel a bit more ragged and rough around the edges, it doesn't detract from the mature framing and painfully realistic pictures she paints - perhaps not quite as elegant as Lori McKenna, but she'll bring a more direct edge in her writing and delivery that McKenna might balk at, and sometimes, that's exactly what you need. Now on the flip side to that, for as much as I like her last few records So This Is Life and Triggering A Flood, her production can sometimes feel a tad inconsistent as well, which is why some of the critical buzz suggesting this was more of a country affair than Americana was intriguing. Of course, those same critics were also raving that this might just be one of the best records of the year, full of complicated songwriter-driven stories than more of an overarching narrative. So okay, given that this has flown under the radar of pretty much everybody except the diehard indie country set, I really wanted to give this a listen, so what did we get on What It's Like To Fly Alone? So let's get the easy stuff out of the way first: instrumentation and production, and I have to give immediate points to Patton for self-producing the project - which you probably couldn't tell from the arrangements or tone, it's got the assured grace of a professional here! The acoustic guitars are rich and show off some pretty complex picking if you listen for it, the pedal steel and pianos are elegant and provide great melodic counterbalance, the vocals are clear and use multi-tracking with restraint and good taste, and the fiddle pickup... my god, the clarity and texture is absolutely superb, especially given that Patton lets the fiddle take a fair few solos across this record. What's more interesting is that this album doesn't indulge in the vintage indie country cliches - like Jason Eady, this is a record much more reliant on straightforward compositions and clean arrangements that production gimmickery, and while that can definitely work for producers like Dave Cobb, I'm also not going to lie and say it can be a tad played out. That said, I'm not without my quibbles in the arrangements here - I do feel the percussion and bass grooves are a little underdeveloped and could afford to add a little more momentum overall, and when you're playing to a more traditionalist style of composition, cuts that are a little less developed lyrically like 'Sometimes She Flies' don't stand out as much, even despite being quite good on their own. That's important to note: there's no outright duds on this record, even the cuts I'm not as crazy about like 'Gold Standard' and 'I've Got One Waiting' - in the latter case despite liking the energy the hook can feel a tad clunky - they're all still good songs! And the great cuts like the minor key darkness of 'Round Mountain' or the phenomenal piano touches behind 'Fourteen Years' and 'Open Flame' are easy standouts, mostly as they feel a little more developed and take more chances with their content and presentation. So about that content... the title of the record isn't kidding here, these are a set of stories - some autobiographical, some not - of women walking a lonely road, sometimes created by circumstance, sometimes by bucking against societal constraints, but nearly always of her own accord. And what I like is that this record is smart and world-weary enough to show the mature consequences that have always lingered behind her choices - she's not about to deny the sins on 'Devil's Hand' or running away from her family on 'Round Mountain', and she's fully aware of the consequences that'll likely come down upon her, but she's more interested in showing the audience the picture and asking why. 'Round Mountain' in particular hits hard in this department - in her religious small town she's expected to be the homemaker and raise the kids without the world of experience she desperately craves and is probably owed, even if the consequences for making that choice late are dire. And I really appreciate the nuance behind the women Patton writes about - just as strong-willed as any swaggering male counterpart, but also willing to ask for help on songs like 'Shove' or question that lonely path on songs like the title track, where she gets sideswiped by a bird after a rough night on the road and sees an odd moment of empathy. And that's before you get the songs where the loneliness really isn't anything she can control - I prefer the more barebones acoustic version of 'Words To My Favourite Memory' she made on Something Together, but a woman facing down the loss of her partner and that moment linked to a great Merle Haggard song fits just as well on this project, and that's before you get tracks like the barroom loneliness of 'Red Bandana Blue (Kent's Song)', reminiscing about an old friend who passed away, or especially the absolutely heartbreaking 'Fourteen Years', written about her sister who died in a car accident over a decade earlier. But she still does have agency, and it leads to one of my favourite cuts here, 'Open Flame', which might as well play as 'Me & Mrs. Jones' written from the woman's perspective - she knows that she could find something real and powerful in this love for someone who isn't her husband... but she took a vow, and she needs to step away before their affection gets any stronger, not played for melodrama but just an achingly sad song, easily one of her best. So as a whole... yeah, this is a damn great record, the sort of unassuming but quietly brilliant project that's going to get overlooked by a lot of people because it's indie Texas country that almost by design plays as low-key. I wouldn't say it's perfect - as much as it's a good cover I probably would have kept off 'Gold Standard' mostly as it doesn't really fit well with the rest of the project - but Patton is such a good writer with such a strength for lived-in detail and mature framing that there's little to criticize! For me, this is an easy 8/10, but like with Jason Eady it's the sort of record that can be hard to recommend to fans of more mainstream country - it definitely plays to an older audience who is willing to take in the fine details and restrained, slower tempos. But if you give this one time... my god, it's so worth it.